What joy to be able to crunch an apple without worrying! After getting yourself fitted with fully-fixed teeth in a day, you’ll finally be able to do just that! CAP City Dental offers you a fast track towards having implanted replacement teeth. In one full day’s treatment you’ll get everything done – preparation, measurement and fitting. You’ll walk out of the practice with a new, confident feeling about your smile. If you have dentures, we’ll replace them with a fully fixed arch of non-removable teeth supported by four to six permanent implants. We can fit both upper and lower arches in the same day. Any missing or loose teeth will be replaced during the same treatment day. We provide a five year guarantee on implants from the date of their placement. Can you bite into an apple without any problems? CAP City Dental uses the latest restorative materials and techniques to ensure a highly professional and long-lasting result. The new implant procedure is also likely to be suitable for patients suffering from bone loss. We’ve aligned all our services to compress many dental visits into one extended visit – making everything far more convenient for you. 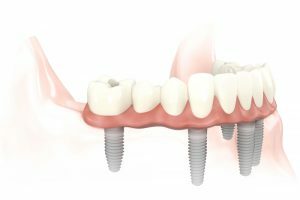 It’s important to note that the teeth fitted to your permanent implants are temporary ones to begin with – because your mouth needs to undergo a 2-3 month healing process. We can provide dental sedation and you’ll also be able to use our Relaxation Room with music and videos during the time that you’re not in the dental chair. Dr Jonathan F Tan is an expert in dental implants with extensive clinical expertise in same-day implant treatments. He is supported by Dr George Druttman, a highly experienced Prosthodontist (Reconstructive Dentistry). Together they will ensure that you receive the most professional dental treatment available. Book your appointment for an assessment today and also find out about our financing options. * After the healing period, we fit your permanent fixed teeth.